Keep Talking and Nobody Explodes is a cooperative, team-based game where one player is trapped with a ticking time bomb that must be defused before it goes off, and their teammates are tasked with coaching them through the process with information found in a complicated Bomb Defusal Manual. The trick here is that only the defuser can see the bomb, and only the “experts” deciphering the defusal instructions can see the manual. The high-pressure play that ensues is a great lesson on teamwork, communication styles, and operating in a crisis. Wharton professor Ethan Mollick uses the game to illuminate these and other learning points within the context of entrepreneurship, and has long partnered with the Learning Lab to deliver the simulation with laptops that we lend out from our Exec Ed group. However, when Facebook released the Oculus Go, and Mollick subsequently discovered that Keep Talking was one of the available game apps, he asked the Lab to help him bring his bomb-diffusing entrepreneurship experience up to the next level – and into the realm of virtual reality (VR). 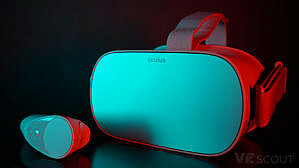 On the surface, Oculus Go kits present an intriguing value proposition over laptops. First off, they’re a lot cheaper ($249, as of this post), they don’t require wires or cables, and they’re compact (thus, highly portable). These are all key factors that play into the efficacy of supporting a technology-based solution at classroom scale. After all, with the limited amount of time between scheduled classes, there are precious few minutes to burn setting up an interactive learning experience (ergo, quicker is better). Can “Go” products connect to University wifi? How long is a headset’s battery life? Will operating the VR accessories be intuitive for students? If something goes wrong, how do I triage issues? These were critical questions that needed to be answered before I could commit to supporting Oculus devices in the classroom setting, no matter how excited Prof. Mollick was by the prospect. Fortunately, I was able to allay most of those concerns once I got my hands on a few headsets of my own – for research purposes, naturally. With a bunch of identical Go kits spread out in front of me, I immediately realized we’d need an effective way to track which controller went with which headset. Since they all look the same – and are completely wireless – it’d be virtually impossible (no pun intended) to tell at a glance what went with what, once they were out of their cases. To solve this issue, I bought a label-maker and came up with a naming convention to keep everything straight. I then downloaded the Oculus app for my iPhone, inadvertently queueing up my next problem: Just as I feared, the devices could not connect to the University’s wifi. Later I found out they can be used without a web connection, but the initial setup does require the internet. Penn’s security necessitated a far more complex pairing process than the Oculus could manage, however. After a series of tries and misses (connecting to the guest wifi, using a special devices-only wifi ssid, etc. ), I had to bring out the big guns and create a wireless network. Luckily I was able to use my phone as a mobile hotspot, but unless you’re in a similar pinch, I would not recommend this route because the speeds are lacking (and the initial setup is a lonnnng process). If I had to do it again, I’d work with our IT support staff to find a workaround for connecting to the University wifi – or get a wireless router and set it up myself. Finally, I was ready to Go. *A quick note – I was able to pair all 9 of the Go devices I had at my disposal to one Oculus account on my mobile device. I bought a Keep Talking game in the Oculus app store and was able to easily download it to each device, as applications are tied to the account, not the Oculus Go itself, so I was able to purchase the game once and load it onto each headset. After that, I was able to turn off the wifi connection and still play the game – a critical answer to the question of whether these VR devices are practical for classroom use on campus. 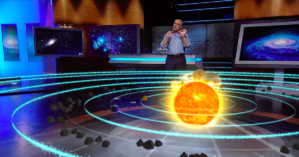 Augmented reality (AR) is a potentially great game-changer in the classroom setting. It provides two new aspects to education that can greatly boost the learning experience: namely, control and visualization. 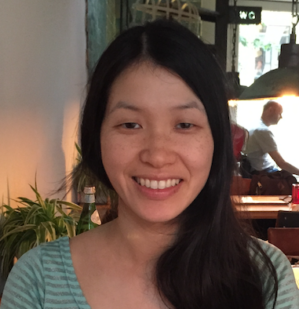 As an undergraduate student-researcher in the Learning Lab, I worked on developing a proof of concept mobile app that is able to demonstrate the benefits of AR when studying more complex, difficult material. For this app, I demonstrated how simple usage of AR can help students learn statistical concepts such as multivariate regression, which involves 3D visual aspects of visualization. This app allows users to visualize 3D data space with control over the visuals (unlike current 2D static images) by holding their phones up to a PowerPoint image. Users can also toggle regression on and off to see how it would appear in 3D space versus 2D. 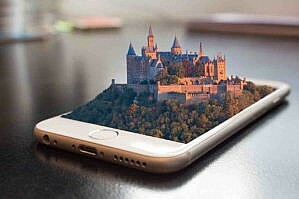 Many people would imagine building an AR app would be difficult but, in fact, with the numerous amounts of software packages and libraries – including marker-based image recognition software and a variety of 3D objects to use in apps – developing AR apps has never been easier. For example, Vuforia is a company that provides software that allows developers to create model and image targets that can be easily identified and tracked in an AR app. Combining this technology with Unity, a game engine for developing apps and games that involves graphics, and a couple lines of C# scripts, I was able to create a fully functioning mobile app in no time. Another bonus with the combination of these technologies for AR app development is that you can easily build apps in both IOS and Android. Another part of my research under the Learning Lab was mining social-media feeds for performing sentiment analysis to gain a better understanding of the perception of augmented reality in the public sphere. Using GWU’s Social Feed Manager, an open-source software library that allows researchers to mine tweets from Twitter on a large-scale basis, I was able to collect a database of over 50,000 recent tweets surrounding AR and VR (virtual reality), and specific products surrounding these technologies. To dive deeper on the latter, I was able to pull tweets surrounding Microsoft’s HoloLens and the startup Magic Leap’s One AR glasses. Pulling tweets on these products can allow researchers like me to better understand market perception of different products. However, in order to perform sentiment analysis on tweets, I trained a machine-learning classifier model –specifically, a deep Recurrent Neural Network (RNN) – that uses Long Short-Term Memory (LSTM) units with PyTorch. This type of model is often used for text analysis and natural language processing, since it keeps memory of information received previously. 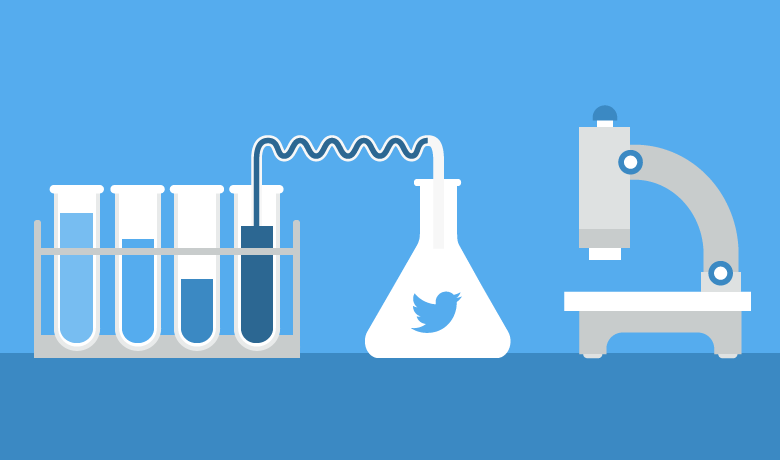 I opted against using a pre-trained model, since I wanted to use a model that was specifically trained on tweets. Then I pulled Sentiment140’s tweet dataset, which has 1.6 million tweets and sentiment labels for each tweet, and performed data cleaning and preprocessing, including stemming and tokenization of the tweets. Lastly, I trained the RNN on the tweets. Overall, the trained model had a testing accuracy of around 84%, which is decent for natural language processing. Below are a couple of results I received from running the model on the AR/VR tweets. Take from this what you will, but it’s great to see that AR/VR has overwhelmingly positive sentiments compared to the control, and I have no doubt that, as we continue to perfect the technologies, we will also continue to realize the benefits of AR as an education technology. Jesse Cui is a dual-degree Wharton undergrad in the Jerome Fisher program in Management and Technology, who studies computer and cognitive science at the Penn School of Engineering and Applied Science, as well as operations, information, and decisions. Learning Lab Technical Dir. 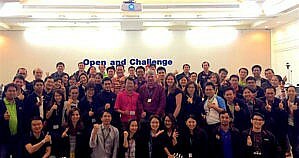 Sarah Toms (center) stands with students she guided through the Executive Development Program (EDP) sim in Thailand last year. What do the Hong Kong University of Science and Technology, the IE Business School in Madrid, HEC Paris, and Dubai’s S P Jain School of Global Management all have in common with Wharton? Well, besides being among the Financial Times‘ top-ranked MBA programs in 2017, they all use simulation games developed right here in the Learning Lab. And they’re not alone. Around the globe, from the Grandes Écoles (“Grand Schools”) of France to top universities in Copenhagan, Australia, India and dozens of other countries, there are thousands of students applying their burgeoning business acumen to The Startup Game and OPEQ — two of our best-selling sims available through Harvard Business Publishing (HBP), which recently issued a report detailing worldwide distribution of both games in 2016. Their popularity in Wharton entrepreneurship and negotiation classes notwithstanding, the HBP report is a noteworthy success for our team in that it illustrates the symbiotic synergy between the goals of the Learning Lab and those of the University at large. The former reflects the expressed intentions of our namesake, Alfred West Jr., who gifted the School with $10 million in 2001 to establish a veritable laboratory for creating “innovative learning tools that challenge students to think strategically across business functions and organizations” and enable Wharton to “take a lead role in rethinking the learning paradigm.” Nearly two decades later, the Learning Lab’s historic mission is increasingly central to President Amy Gutmann’s own vision for the future of the University of Pennsylvania. Wharton Dean Geoffrey Garrett in Seoul during his “Global Conversations Tour,” where he shared his vision for the School. Sharing an ethos that embraces collaboration and the exchange of knowledge is Wharton Dean Geoffrey Garrett. “Globalization and technological change are poised to transform business education. I have no doubt Wharton will be in the vanguard of this transformation here and in other countries,” he stated upon taking over the position in 2014. The School’s Executive Education division has helped draw an international audience as well, partnering with the Learning Lab to build custom learning experiences for foreign audiences both on-campus and abroad. 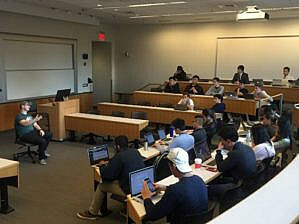 In 2016 alone, more than 1,000 participants experienced one of our simulations in their Wharton Exec Ed program. One of Africa’s foremost financial institutions, for example, has sent over managerial staffers for a two-week business-leadership bootcamp built around the EDP Simulation four times in the last two years! (And it always ends the same: with a celebratory, fist-pumping “warrior chant.” See it in the video below.) Among dozens of other games to cheer for, I should note, we developed a similar EDP program for a multi-national manufacturer in Thailand, which Technical Director extraordinaire Sarah Toms flew out to personally facilitate in 2016. From the start, Dean Garrett has made it known that, though seated in the U.S., he sees Wharton as an asset to the entire world — and, in turn, bringing the world into the classroom in order to prepare students to be truly global leaders. 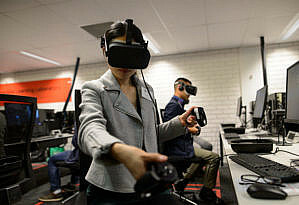 Whether that classroom is in Singapore, Saudi Arabia, Switzerland or Estonia, Learning Lab sims like OPEQ, The Startup Game, and EDP are doing just that, augmenting traditional learning in undergraduate, MBA, and executive education programs with dynamic, virtual “real-life” business experiences. And while they may be created with faculty members here in Philadelphia, they are now driving home their educational underpinnings on campuses around the globe. Look no further than the Learning Lab for proof that games play an increasingly valuable role in the classroom and beyond, having long been recognized as a uniquely effective means of experiential education. But while, today, we harness technology and data to craft immersive, competitive simulation platforms, sometimes all you need to teach complex concepts is a board, some moveable pieces, and a pedagogical goal. Take chess, for instance, which has been used for centuries to impart lessons of military strategy – its rules and competitive purpose create the conditions for tactical thinking and planning needed to checkmate one’s opponent. 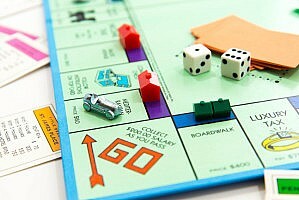 Then there’s Monopoly, wherein the primary objective is to bankrupt everyone else through clever investment strategies. Hard to square that with lofty, Ivy-league business objectives, right? Yet, what is arguably the world’s best-selling board-based simulation of capitalism (and frequent ruiner of family game night) was once used as a teaching aid in Wharton economics classes. But before you cynically smirk at the very idea, there’s something you should know about the game’s hidden history: A century ago, Monopoly was not a platform to illustrate the merits of a laissez-faire system; rather, it was a way to demonstrate an alternative to the corporate rent-seeking that drives inequality. 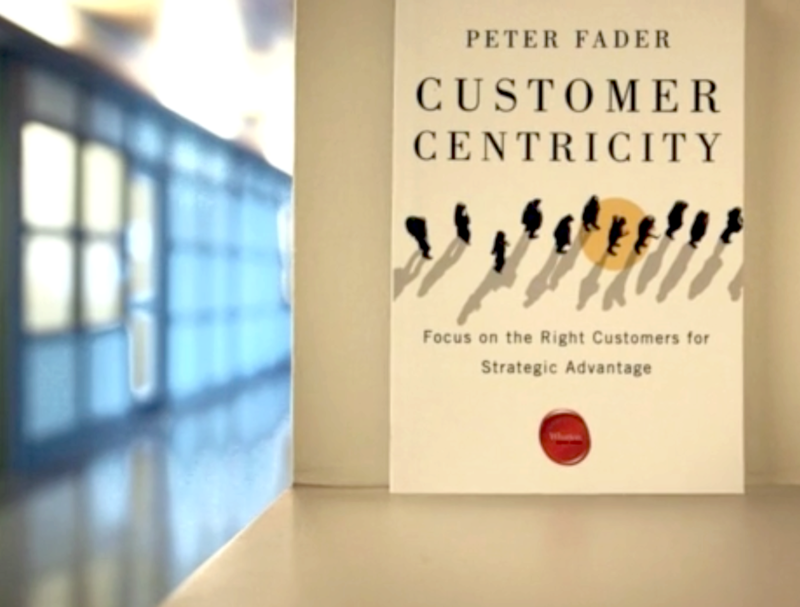 If you’ve ever sat through one of Wharton marketing professor Peter Fader’s highly engaging lectures on the merits of a customer-centric business model (or read his book on the subject), then you know how quickly he’s able to convince an audience that adopting this game-changing go-to-market strategy can trump a product-focused approach (from a profitability standpoint), and that – if done well – can create the conditions for longterm viability in the perilous, race-to-the-bottom age of commoditization that many companies are grappling with these days. He’ll also handily disabuse any naysaying marketing execs of the notion that using data is just about collecting numbers, driving the point home that simply having a CRM system in place is not where the work ends, it’s where it begins – and leaving no doubt in their minds that if they think all customers are created equal, they have a lot to learn. Indeed, Fader is a maestro at shifting paradigms to embrace the power of data analytics for calculating customer lifetime value (CLV). But for this revolution in marketing strategy to truly take hold, theory must meet practice – and that’s where the Learning Lab comes into play.